Do you consider referrals as one of your most important sources for new clients? If yes, then you’re not alone. 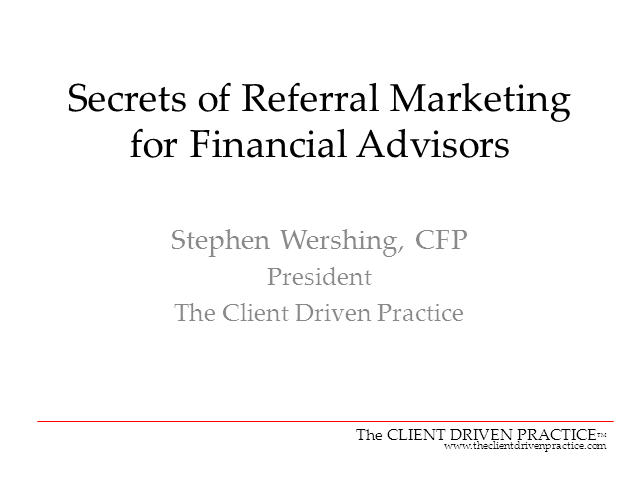 Most financial advisors count referrals as their number one source of new business. How much would your practice grow if you could double or triple referrals? The biggest roadblock for most advisors is the lack of a plan based on principles that work. Stephen Wershing, CFP®, has been a financial advisor for 23 years. In his 14 years as a broker dealer executive, he has coached hundreds of advisors on making their practices more successful. He will share what you need to know about attracting referrals using some of the most recent research available.